How do I Preserve Toothbrushes? Taking proper care of toothbrushes is an important part of dental hygiene and leads to better oral health and a longer-lasting toothbrush. Today, toothbrushes are so much part of everyday life that most people do not give much thought to how they’re used. Just brush and forget about them. But consider that people put these dental implements in their mouths twice a day, every day, and it becomes clear that taking care of toothbrushes becomes an important part of oral hygiene. According to the American Dental Association and the Council on Scientific Affairs, soaking toothbrushes in antibacterial mouthwash or using a toothbrush sanitizer has little or no effect on oral health. Other methods, such as disinfecting toothbrushes in the dishwasher or microwave, could harm the toothbrush and decrease its cleaning effectiveness. The first rule in caring for toothbrushes is simple: when not in use, always keep toothbrushes clean and dry. 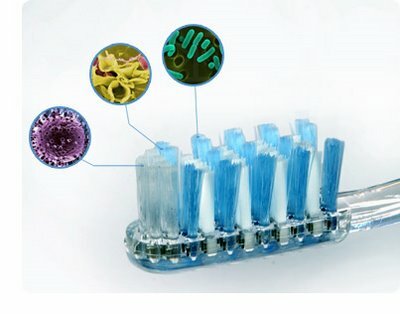 What are the sources of toothbrush contamination? Mouth. Since millions of different types of germs including those responsible for the development of dental caries (S. Mutans) and other diseases are living in the mouth, some of them are transferred to the toothbrush during brushing. Environment. Most people store their toothbrushes in the bathroom. Since the bathroom can be the most contaminated room in the house, it may be possible to find some germs from the environment on the brush. Toothbrush package. Since toothbrushes are not required to be sold in a sterile (germ-free) package, they may even be packaged with germs on them. One toothbrush should have one owner. If you share your toothbrush, you could also be sharing bodily fluids and bacteria, increasing your risk of infection. Showering is good for your toothbrush. Before and after each use, rinse your toothbrush under running water to eliminate excess toothpaste and other residue. Rub your fingers along the bristles – but only after washing your hands; no use substituting one set of germs for another. After using your toothbrush, shake it vigorously under tap water. Toothpaste and food debris are tempting targets for the bacteria that live in mouths. Depriving these bacteria of at least one food source helps keep their numbers down. When you’re finished, shake out the brush to accelerate drying. To keep your toothbrush and yourself healthy, make sure you let it dry out between uses. Toothbrushes can be breeding grounds for germs, fungus and bacteria, which after a while can build up to significant levels. Store the toothbrush in an upright position so that it can air out while at the same time, use a toothbrush cover. Howard Glazer, spokesman for Academy for General Dentistry, recommends the use of a toothbrush cover as it effectively protects the toothbrush from various elements: splattering water, skin contact and contact with other toothbrushes. However, it is important to remember to not store toothbrushes in closed containers. A closed container keeps moisture in, making the toothbrush more susceptible to microorganisms such as germs, bacteria and fungus that flourish in moist environments. To prevent cold and flu viruses from being passed between brushes and to allow for faster air drying, try to keep your toothbrush from touching others when it is stored. A standard toothbrush holder with slots for several brushes to hang upright is a worthwhile investment in your family’s health. Keep toothbrushes away from the toilet; close the toilet lid before flushing. While flushing, droplets of contaminated water floats into the surrounding areas, and may land on counter-tops and sinks. Thus, dentists recommend a minimum of 6 feet distance between a toothbrush and the toilet. Even better – close the toilet lid before flushing. Most dentists agree you should change your toothbrush every three months. Studies show that after three months of normal wear and tear, toothbrushes are much less effective at removing plaque from teeth and gums compared to new ones. The bristles break down and loose their effectiveness in getting to all those tricky corners around your teeth. Because people brush differently in terms of the amount of pressure applied and also the length of brushing time, toothbrushes may wear out at different rates for different people. Rather than rely on the rule of thumb figure, simply check the toothbrush for worn bristles on a regular basis. Then replace as needed. Parents should check children’s toothbrushes often, as the softer bristles in children’s toothbrushes may wear out faster than those in adult brushes. It is also important to change toothbrushes after you’ve had a cold, the flu, a mouth infection or a sore throat. That’s because germs can hide in toothbrush bristles and lead to reinfection. Even if you haven’t been sick, fungus and bacteria can develop in the bristles of your toothbrush —another reason to change your toothbrush regularly. 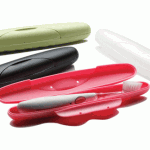 How can I protect my toothbrush when traveling? 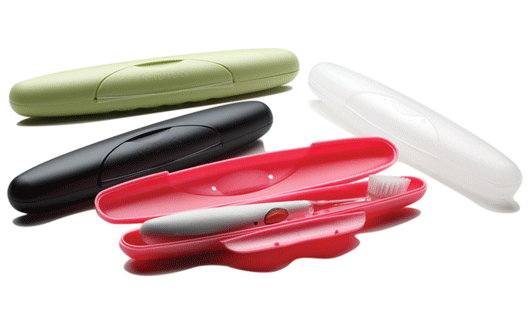 A plastic toothbrush case will protect toothbrush bristles from becoming squashed or flattened in your traveling kit. After brushing, however, you should let your toothbrush dry in the open air, to help reduce the spread of germs. Do Electric Toothbrushes Really Work Better Than Regular Ones? How Do Sonic Toothbrushes Work? This entry was posted in Oral Care, Toothbrushes and tagged bristles, germs, oral hygiene, S.mutans, sterile, toothbruh sanitizer, toothbrush, toothbrush cover, Toothpaste on September 22, 2011 by chzechze.